It's about time we made a start with a gallery for the famous Walter M. Murphy Company! So here it goes. 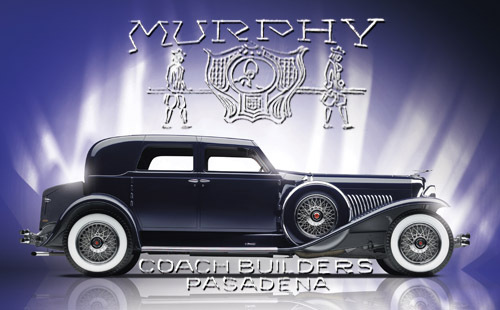 Walter Montgomery Murphy (1881-1961) founded his coachbuilding company in 1920 in Pasadena, California and is best known for their numerous creations on the Duesenberg Model J chassis. Therefore, the first two cars to grace the gallery are the Duesenberg Model J Sport Berline "The Whittell Mistress Car" and the Model J & SJ Disappearing Top Coupe. To read almost anything there is to know about Murphy, we kindly refer you to www.coachbuilt.com. Click here for the Duesenberg Model J Sport Berline Gallery. The wonderful studio shots by Darin Schnabel and ACME Photo are all sized 1600x1200 to be used as wallpapers. Click here to see several examples of the Duesenberg Model J & SJ Disappearing Top Coupe.